Piranha Games has announced that the first-ever Mechwarrior Online World Championships will take place next year, with the hot mech-on-mech action set to start in the first quarter of 2016. The championship will kick off with regional qualifiers in North America, Europe, and Oceania, followed by regional championships for each. The three top units will be flown to an as-yet-undetermined location for a LAN throwdown to determine the ultimate Giant Fighting Robot Driver, and to claim the $100,000 seeded purse that's up for grabs. The "seeded purse" represents the base prize amount put on the table by Piranha, which could grow significantly depending on future sponsorships, or perhaps through mech skin sales dedicated to supporting the tournament—something similar to how Valve cranks up the Dota 2 International prize pool to ridiculous heights through sales of the Compendium. Whatever the details, the bottom line is that it will be a hefty chunk of money, and the winner will get a hefty chunk of it. 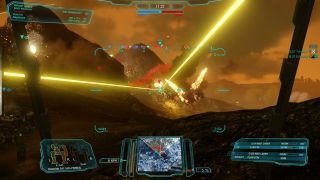 Mechwarrior Online recently went live on Steam, and also (finally) rolled out Community Warfare, which pits the various factions of the Inner Sphere against one another in a persistent universe. Piranha said at the time that more "large updates" are expected in the near future, and we will also presumably being hearing more about the World Championship relatively soon as well.